Successful traders have a winning trading plan. They make the plan and trade accordingly. The trading plan is prepared by rigorously studying the market and eventually doing its analysis. Successful traders honestly accept trading as a business. Some of the practices are: they establish their own accounting system in the form of simple excel spread sheet, which has all the trading records. They also keep a good filing system, which consists of printouts of different trading activities, stock records and the transactions. They prepare a trading diary, which includes comments about right and wrong trade practices, changes to make in the current portfolio, new strategies, if any. 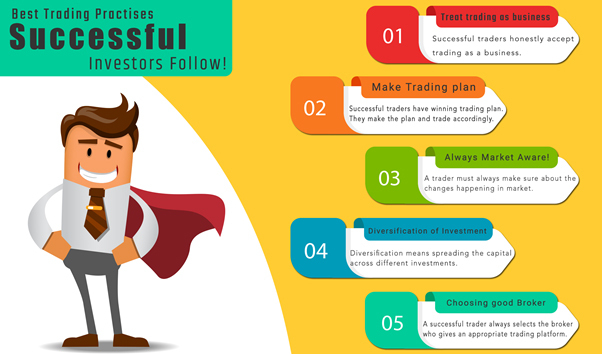 Overall, successful traders follow these practices to maximize their business potential. Successful traders have a winning trading plan. They make the plan and trade accordingly. The trading plan is prepared by rigorously studying the market and eventually doing its analysis. Different traders have different strategies for making a trading plan. Intra-day traders, short-term traders and long-term traders definitely have their own trading styles and hence their trading plans also differ a lot. Preparing a trading plan helps them identify the strongest stocks in the strongest sectors of the market. It also avoids overtrading, which in turn reduces losses. Stop loss is known, which takes the emotion out of trading. Successful traders continuously research on the markets and refine their trading plan. A trader must always make sure about the changes happening in market. Successful traders believe in research and are always alert about the changing market. This is one of the factors, which make them successful. For example, if government bans a particular product, the demand for its alternative drastically increases. This alternative market is considered as an opportunity for investment by successful traders. Contrary to this, if the trader has already invested in the banned product, he/she must make sure that it is disinvested at the earliest. Successful traders make sure that they diversify their investment portfolio. Diversification means spreading the capital across different investments. So, if one investment performs poorly, the other investment may perform better, thus reducing the losses. A successful trader always selects the broker who gives an appropriate trading platform. Researching the differences between brokers will eventually help the trader, as he/she gets to know about the various policies offered by brokers. The most important factor to consider while choosing a broker is broker’s policies. Also, one must keep in mind that he/she should choose a good broker along with a good platform. No compromise must be done between any of the two factors. Successful traders always keep a track on what they are doing to identify bad trading practices. They continuously update their trading journal (where trades are recorded), which helps them identify wrong steps taken in an unsuccessful trade. Tracking can be done using excel sheet or simply by pen and paper.